Looking for higher yield from your investments? Here are three energy holdings worth taking a closer look at. In the current low-interest-rate environment, plenty of investors have been hunting for higher yield from dividend stocks. This hunt has driven the valuation of many blue chip dividend payers to near-nosebleed levels. Not only has this trend watered down the effective yield on those stocks, since they trade at premium prices, but it's also increased the downside risk of short-term losses in a market correction. So what's an income investor to do? A great place to look for underappreciated income stocks right now is the energy industry. Oil and gas prices remain far below recent highs, and a lot of companies in the sector continue to struggle. But there are still some wonderful companies paying solid dividend yields, with varying levels of risk. Here are three high-yield investments in the energy industry to consider: midstream stalwart Magellan Midstream Partners, L.P. (NYSE:MMP), overlooked French integrated giant Total SA (ADR) (NYSE:TOT), and the supermajor Royal Dutch Shell plc (ADR) (NYSE:RDS-A) (NYSE:RDS-B), which is early in its plans to focus on deepwater and natural gas, making its dividend a little riskier. Keep reading to learn from our Fool contributors more about these high-yield energy investments and why they may be ideal for your portfolio. Matt DiLallo (Magellan Midstream Partners): With a current yield of 4.4%, Magellan Midstream Partners definitely offers investors a high yield. However, what I like about the company's generous payout compared to other options is that it comes with a much lower-level risk. Supporting Magellan Midstream's low-risk payout is the stable cash flow it generates from its asset base. Overall, the company gets about 85% of its gross margin from providing fee-based services to the oil and refined-products markets. Magellan's main business is moving refined products under fee-based contracts, which makes its cash flows stable and secure. Image source: Getty Images. The company typically distributes about 80% of that cash flow back to investors, retaining the rest to help finance growth projects. That's a fairly conservative ratio for an MLP, because many others pay out close to, if not more than, 100% of cash flow. Magellan's conservative approach has paid off during the recent oil market downturn because the company hasn't had to follow its more aggressive peers in slashing its payout. Instead, the company has been able to grow the distribution as it completes high-return expansion projects, recently notching its 59th consecutive quarterly increase. Another reason there's minimal risk associated with Magellan's payout is that it doesn't use much debt to grow its business. As a rule, the company keeps its leverage to less than four times debt-to-EBITDA, which is well below the comfort level of most other midstream companies. In fact, its leverage ratio has been below 3.5 in recent quarters. Because of that low leverage, the stability of its cash flow, and its conservative payout ratio, Magellan Midstream Partners has one of the highest credit ratings among MLPs. That provides investors with a high level of confidence in the security of this high yield. Tyler Crowe (Total SA): It's not shocking that brand recognition can have a big influence on the types of investments we make, so investors in the big oil industry might overlook Total because it doesn't have the retail presence in the U.S. that many of its competitors have. That shouldn't keep you from making an investment in this stock, though, because you would be missing out on what has become the leader in the industry in returns on equity for its investors. As the oil crash really started to take hold in late 2014 through early 2016, Total was in a unique position because many of its major capital projects were brought on line. This development had two big benefits for the company: It allowed it to wind down capital spending and keep its percentage of unproductive working capital low, and it meant rapid increases in total production that helped to offset the declines from realized prices. This is how Total was able to surpass ExxonMobil for the highest return on equity in the business, even though ExxonMobil has an inherent advantage in this metric because it has bought back loads of shares over the years and kept its equity value low. TOT Return on Equity (TTM) data by YCharts. What is encouraging, though, is that the company has been taking steps to ensure that these returns aren't just a fluke of the downturn. Over the past couple of years, management has signed multiple concession contracts with national oil companies in the Persian Gulf that represent 50 billion barrels of resources, 300,000 barrels per day of production, and a 15% return on average capital employed at today's prices. These low-cost, long-life, high-return projects will help boost profitability over the long term and will be a pillar to support growth in its other big investments in deepwater and LNG. For investors, all of this comes with a stock that currently yields 5.3%. If you want a high-yield investment with the potential to grow and last for a long time, Total is worth a look. Jason Hall (Royal Dutch Shell plc): With a 6.7% yield on its B shares and over 7% on its A shares (there are different tax implications for the two share classes), Shell is certainly a high-yield stock. And while that yield can make it attractive, it's worth making sure you understand that there is some risk the company could be forced to cut payouts. 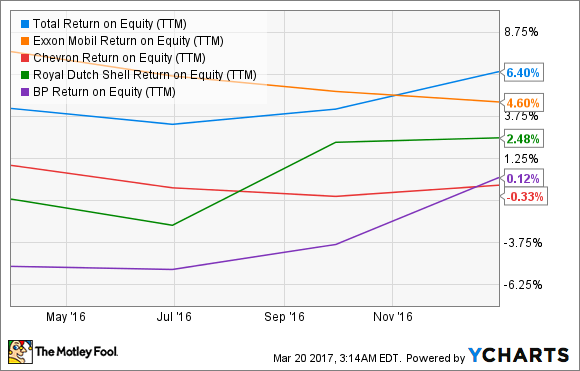 Shell made two significant moves that allowed it to acquire BG Group, but those moves also significantly increased its cash outflows. Since the acquisition closed in early 2016, Shell's share count has increased more than 27%, while management has kept the dividend steady, leading to an increase in total dividends paid. 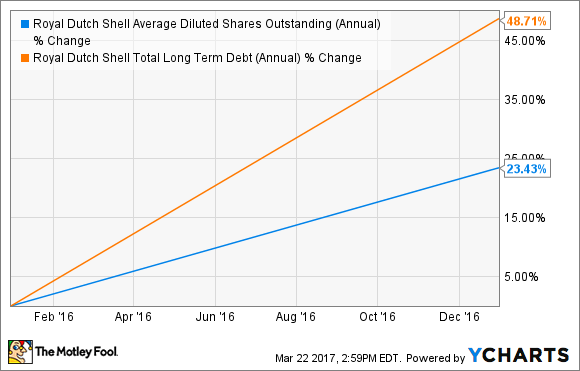 Shell's debt has also ballooned, from $53 billion at the end of 2015 to almost $83 billion at the end of 2016. RDS.B Average Diluted Shares Outstanding (Annual) data by YCharts. Combined, the higher share count and debt added $1.6 billion in higher cash outflows to cover these items versus 2015. And since the BG Group acquisition happened several months into 2016, the full annual incremental expense on these two items is likely to be closer to $2 billion. In short, Shell's cash inflows and outflows are a bit out of whack right now, and it's going to take some balance-sheet work to address this matter. Management has targeted over $30 billion in assets it plans to sell off, both to pay down its debt and to focus the company on deepwater and natural gas assets. With $19 billion in cash on hand, there is some margin of safety, and management has stated multiple times that sustaining the dividend is a priority. But make no mistake: The dividend will be unsustainable if cash flows don't improve or debt doesn't come down. I like the odds that management will pull off its plans, but the current dividend is not as safe as are those of the companies my colleagues wrote about above. Invest accordingly.